Acer has pulled back the cover on the Canadian launch of its W700 tablet, which will hit stores here on Oct. 26. It’sAcer’s first ever Windows 8-native tablet, according to our sourcestory from MobileSyrup. It will feature a price tag of $749 here inCanada, which is actually $50 less than the MSRP in the U.S.,MobileSyrup notes. 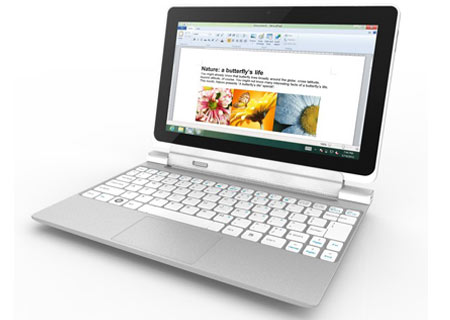 The Acer Iconia W700 tablet withthe keyboard attached. The lowest-cost version of the W700 willsport a 1080p screen measuring 11.6 inches, a Core i3 processor, bothrear and front cameras, three USB 3.0 ports and 4GB RAM. There’s also afree dock and a Bluetooth keyboard so you can basically turn it into alaptop if you like.